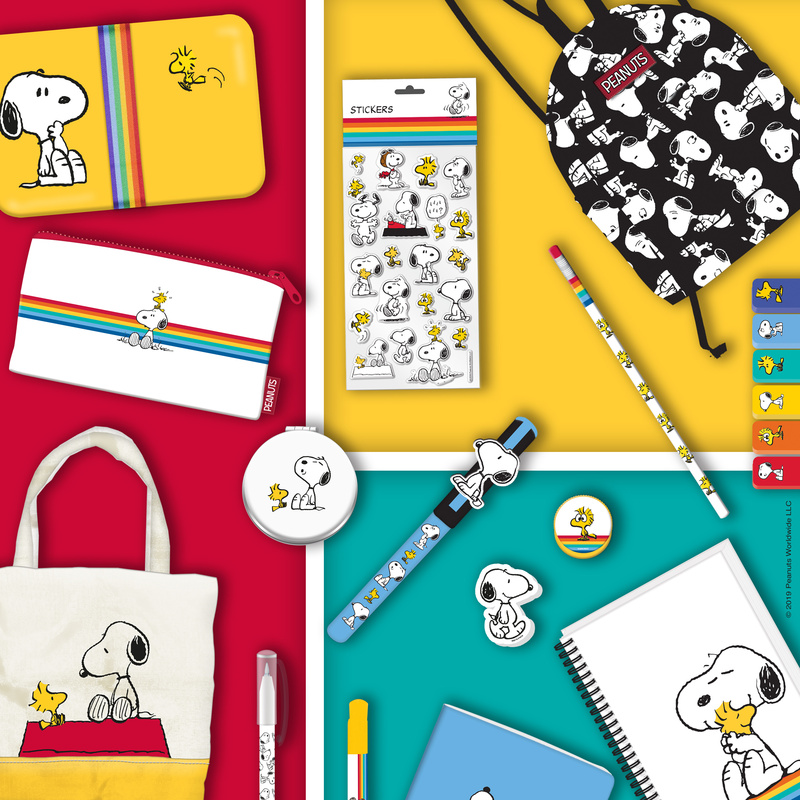 London, UK, 4 February 2019 – CPLG have brokered a number of new deals for Snoopy and the Peanuts gang in the UK, across a range of consumer products categories, as Peanuts gears up to celebrate its 70th anniversary in 2020. In apparel, Fashion UK were recently signed for kids’ daywear, with their first range launching into retail this Summer. Kokomo are signed for health and beauty products, to include bath and body care, oral healthcare and accessories, launching for Autumn/Winter 2019. Blueprint have expanded their stationery offering with the addition of gifting items. Hype have come on board for greeting cards, launching their first mini-cards range recently at Top Drawer, the UK trade show for the home, gift and fashion industry. Ecell Global are signed for phone cases, and Portico for calendars. In the food category, Asvina have launched Roasted Peanut Cookies and Peanut Butter featuring the loveable Snoopy, Woodstock and Charlie Brown on packaging. These new deals join a host of existing licensees already in place for a number of categories, including nightwear (Somerbond, Aykroyds & TDP), hosiery (Misirli), adult apparel (Brand Alliance), babywear (Paul Dennicci), footwear (Brand International Group), accessories (William Lamb), and plush (Aurora). Charles M. Schulz first introduced the world to the Peanuts characters in 1950, when the Peanuts comic strip debuted in seven newspapers. Since then, Charlie Brown, Snoopy and the rest of the Peanuts gang have made an indelible mark on popular culture. Peanuts animated specials and series air on major networks and streaming services, including ABC, Cartoon Network and Boomerang in the U.S., Family Channel in Canada, and the WildBrain network on YouTube worldwide. Fans also enjoy Peanuts through thousands of consumer products around the world, amusement parks attractions, cultural events, social media, and a daily comic strip available in all formats from traditional to digital. In 2018, Peanuts partnered with NASA on a multi-year Space Act Agreement designed to inspire a passion for space exploration and STEM among the next generation of students. The Peanuts characters and related intellectual property are 41% owned by DHX Media (TSX: DHX, NASDAQ: DHXM), 39% owned by Sony Music Entertainment (Japan) Inc., and 20% owned by family of Charles M. Schulz. This press release contains “forward-looking statements” under applicable securities laws with respect to DHX Media including, without limitation, statements regarding expected Peanuts licensing arrangements and the business strategies and operational activities of DHX Media. Although DHX Media believes that the expectations reflected in such forward-looking statements are reasonable, such statements involve risks and uncertainties and are based on information currently available to DHX Media. Actual results or events may differ materially from those expressed or implied by such forward-looking statements. Factors that could cause actual results or events to differ materially from current expectations, among other things, include the ability of DHX Media to execute on licensing arrangements and other factors discussed in materials filed with applicable securities regulatory authorities from time to time including matters discussed under “Risk Factors” in DHX Media’s most recent Annual Information Form and annual Management Discussion and Analysis, which also form part of DHX Media’s annual report on Form 40-F filed with the U.S. Securities and Exchange Commission. These forward-looking statements are made as of the date hereof, and DHX Media assumes no obligation to update or revise them to reflect new events or circumstances, except as required by law.